Weight loss surgery is hot. A lot of people are starting to see it as the only effective treatment we have for obesity. That’s just insane. 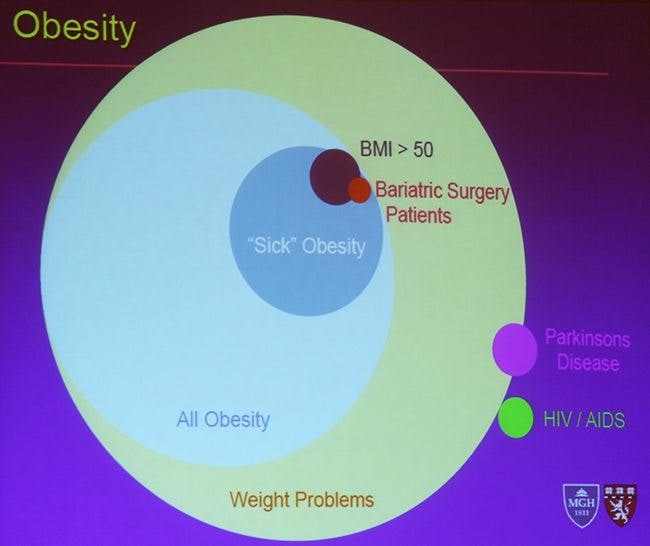 Here are some slides from a lecture at the obesity conference last weekend. The slide above shows the magnitude of the obesity problem. Bariatric (weight loss) surgery will hopefully never have to be used on more than a small minority of obese patients. Here’s the three most common surgical procedures today. All of them are about stopping the normal function of the digestive system. The more effective surgeries (like Gastric Bypass) actually disconnect or remove healthy organs. We live in a sick world when we need to surgically adapt our bodies to our industrial processed food. 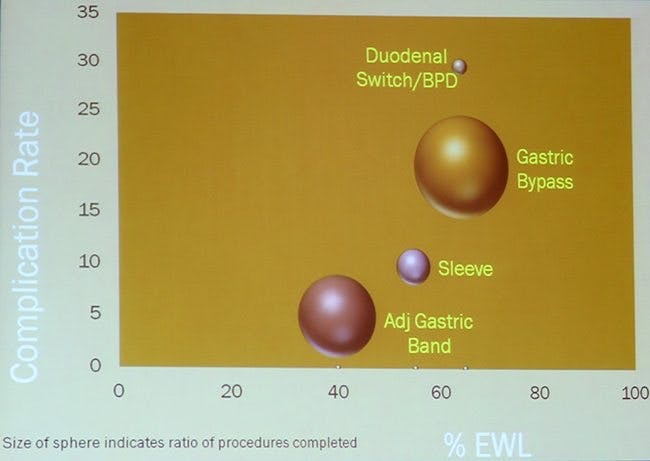 The bigger the surgery the more effective it is, with a higher percentage of EWL (Excess Weight Loss). But at the same time the risk of compications increase. Vitamin deficiencies are common after weight loss surgery, but here they don’t tell us how common. I love how they instead claim that “Vitamin/Protein malnutrition is a result of non-compliance with vitamin recommendations and food sources”. Really? Another explanation could be that vitamin / protein malnutrition is a result of removing or disconnecting the organs that absorb vitamins and protein. But of course then doctors couldn’t just blame the fat patient. Removing healthy organs is not the solution to bad food. Doctors see it as effective because it's obscenely profitable. And it's cash money – no discounts. Things might be different in Sweden, but over here it's all about cash money. I must not be making myself clear. "You've just described an eating disorder." No, I've described a disordered endocrine system. When insulin levels are high, it is perfectly natural to eat more and more because an energy deficit has been created as calories are shunted to fat storage instead of to energy. What would be an "eating disorder" in that situation would be to ignore the hunger signals and not eat. That's not what we evolved to do. We evolved to seek food when the body signals an energy deficit, and the problem is that the standard "healthy" diet unbalances things so that the hunger signal is being sent out all the time. The signal is there in the hormones, not in the imagination, and we have a powerful biological, not psychological, drive to heed its directives. Michelle, you say you would have tried LCHF - but you don't know what would have happened. It's quite possible that the novel freedom from constant hunger would have been enough to keep you on the diet, with weight loss as a secondary benefit. And that's the true "miracle" of LCHF: as miserable as people are being overweight, I'm sure the constant hunger of a high carb diet is even worse. LCHF fixes that. If the surgery changed your life, Michelle, I'm glad about that. But I'd much rather see people - especially kids - try a LCHF approach and discover that they don't have to be hungry all the time. If that doesn't work (but I'm sure that it would), surgery might be an option. The surgery initially causes weight loss by sheer starvation (which is no way to treat a metabolic disorder). The weight will eventually come back on as you eat more and stretch the pouch. People prone to obesity are victims of a vicious cycle of constant craving from wild swings in blood glucose/insulin resistance/functional leptin resistance, this in turn will stretch the pouch to once again accomidate a sizeable amount of food. This is not the answer at all, in fact, it is a very barbaric and illogical solution to a metabolic disease. I have very good friends (all physicians) who advocate semi-starvation diets to patients for weight loss, all the while admitting that the long term success of calorie restriction is dismal (I tell them to starve themselves and see how it feels). Starvation is a cruel thing to inflict on people and especially young inocent children. Cutting a patient for short term results is even worse!! We need to stop this madness. We need to protect patients, and young children who are made to feel awful about this diagnosis! I am tired of this nonesense! "A woman that I met in Jackson Memorial Hospital was not so lucky. This woman had lost her intestines due to a blood clot in her mesenteric artery, cutting off the blood flow to the bowels. The thrombosis was caused by a faulty gastric bypass surgery she underwent sometime earlier. (A side point I’d like to cover; I was told by the transplant staff at Jackson Memorial that the number one cause of people losing their intestines and needing transplants are as a result of gastric bypass surgery, so if you’re considering that procedure, you might want to give some consideration concerning its safety)." I know two people who had gb surgery, and both lost over 100# each, one a lot more, but both have constant health problems from vitamin-mineral deficiencies, hormonal dysfunction, and both struggle to not regain weight since they don't like staying on the lc diet prescribed. This is no panacea; and many people begin to regain weight like Carnie Wilson, John Popper, Ann Rice, and more. So while people may be better off in some cases by having the surgery, it's not a free ride either. Zepp We are all mammals...Now REALLY? thank you for the greatest revelation ever! Especially because we are mammals we should NOT consume milk products and derivatives as ADULTS!! this is my point. Do you see ANY other ADULT MAMMAL in nature drinking the milk of their own species let alone that of an alien species (as adults I must emphasise this)? In fact most humans have as I said previously retained the healthy mutation that makes lactose in milk indigestible as adults. So biologically and ancestrally as adults we are not meant to be able to digest and consume a body fluid that is intended solely for the growth of the young. We Europeans have recently 'acquired' the ability to digest lactose as adults but vraious levels on intolerance persist. This is important in some way to your adaptation to cooler climates perhaps but in teh long run milk and derivatives consumptation has left us as osteoporotic as ever. The tribes you refer to like Masai etc are regarded as neolithic herders with some hunter-gatherer practices. Anything that involves domestication from a puritst paleo point of view is to be regarded as Neolithic. Ethically I also have strong reservations at how dairy cattle are treated hence my strong stance. From teh point of view that i think everybody is free to make their own decisions...the products are out tehre so you jsut have to help yourself. Also try search pub med with his name or even google and you will find more. "Do you see ANY other ADULT MAMMAL in nature drinking the milk of their own species let alone that of an alien species..."
There might be arguments to be made about whether humans should consume milk, but the argument that no other adult mammals drink milk is not one of them. i agree with comment 57 the logic is flawed. i understand where you are coming from, but disagree with you on this. The only reason more animals don't drink milk is that they are not smart enough to get the cow to stand still (except the cat of course, who gets someone else to do it for them). You can disagree as much as you like but we remain th only mammal for whom milk is a staple food in teh adult. I udnerstand that a preadtor might kill a female of a different species that happens to be lactating at teh time of the attack and therefore take advantage of the food source but we are the only animal that keeps another (the cow) in a state of permamnent lactation in order for us to milk them daily. Milk is intended for the consumption of the young of teh species only it is expensive to produce so in nature cows or any other mammal would have control on when they produce milk. Yes humans are the only creatures who make and drive cars and who are destroying teh planet and themselves in teh process...how can you say an argument is flawed without providing a valid or any coutner argument? Simply put you guys wish to continue to consume dairies without the worry. be my guest I doubt the dairy industry is going anywhere...so enjoy at your peril but do not try to make it sound normal as it is NOT no matter what you say drinking milk of another species in teh adult is NOT normal! On a cooler head: One of the main argument against milk consumtion in the adult is GENETIC (i am a geneticist so I sould know) and it is the loss of lactase (the anzyme that digests lactose) in teh adult. Lactase persistance (LP) is a recent mutation an aberration found mostly in Caucasian and North African populations where consumption of milk from domesticate farmed animals must have fulfilled some important nutritional need at some point in our evolution so that people with LP acquried an advantage but as with grains the damage done by dairy product consumption is slow/chronic so not obvious. Alexandra I looked into your bear/wolf attacking the udders..ahahahah they are after the udders themselves as they are full of yummie fat and fat as we know is good for us! "... they are after the udders themselves ..."
I don't care much about drinking milk, but it always puzzled me how people who start drinking milk in early childhood and continue to do so without a pause may develop an intolerance to a lactose? 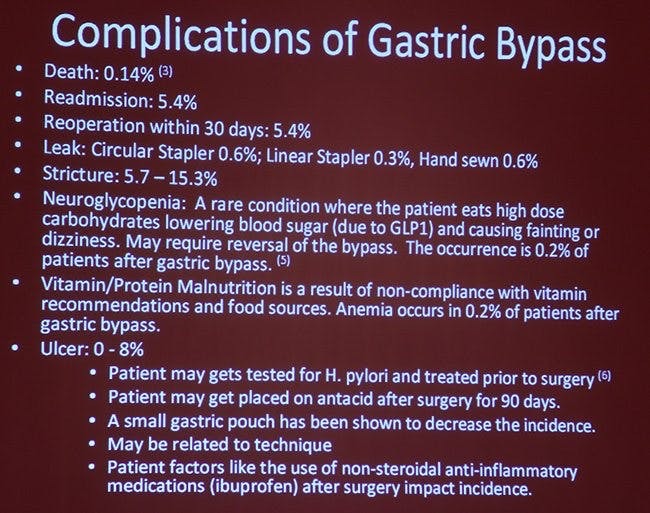 As a gastric bypass patient myself, I want to answer to Dr. J: How does the operated patient lose weight? Actually, it's by starvation only at the beginning, the first six months or so. Then it's trough carbohydrate restriction. The Roux-en-Y that I got actually prevents you from eating not only large amounts, but from eating high carb. It also lessens insulin resistance and effectively eliminates the possibility of getting Type 2 diabetes. I was a low carber before the surgery, but as some of us, I couldn't keep it so strict that I could have lost my extra 60 kg of weight. After 2 years I'm back on low carb, but my control over what I'm eating, and even over my whole life has improved majorly. As I see it, it's good for people with very mild eating behavioral problems that aren't actual eating disorders. I was fortunate and didn't gain any complications or staying problems (other than the dependency of vitamin B supplement). If I had a daughter that would weight 130 kg, would I recommend the surgery for her? Would I pay it for her? The answer is a definite YES. "As a gastric bypass patient myself, I want to answer to Dr. J: How does the operated patient lose weight? Actually, it's by starvation only at the beginning, the first six months or so. Then it's trough carbohydrate restriction. The Roux-en-Y that I got actually prevents you from eating not only large amounts, but from eating high carb. It also lessens insulin resistance and effectively eliminates the possibility of getting Type 2 diabetes"
To determine whether it is purely carbohydrate restriction or a combination of low carb/ starvation will require a clinical trial. Until then it is purely speculation, but fun to contemplate. You do however raise an interesting point. Alexandra ...how about your link on bears INTENTIONALLY killing a cow for the milk....WHAT? I think someone msut be spiking your milk...vodka comes to mind. There may be many explanations for this. Even amongst overtly lactose intolerant people (anybody here with that problem?) there are differences in the way they react. For some is immediate sickness including vomiting upon injesting the offending substance...for others is heartburn. others still is tummy problems diarrhoea and gas...also milk like wheat and grains in general may take a while to have its effect. I had RNY gastric bypass in July 2004. I initially lost 107 lbs at my lowest weight. I quickly bounced back up and remained at a solid 100 lbs lost for a few years. All was pretty good for about the first 3 years or so, then I started feeling very tired. Then I had a 'cardiac event', which was directly related to my ferritin being extremely low. I was faithfully taking bariatric specific vitamins from day one. Drinking protein shakes daily. Both of which my surgeon said I did NOT need to do. I knew better. Yet despite my supplementing, I still ended up with malnutrition issues that continue to this day. It's very difficult to take in enough supplements - when you don't absorb all you take in; and have a small pouch in which to fit everything. I now am battling issues from osteoporosis, low vitamin D, low calcium, low iron and I struggle to maintain good B12 levels. Some things I do sub-lingual, some dry pill form, some liquid. Depends on the supplement. I have developed reactive hypoglycemia and now also hypothyroidism and I have hyperparathyroidism as well. I basically traded one set of problems for another - and at my own doing. What really irks me is that I got obese eating only 1600 calories per day. It wasn't how much I was eating that made me obese - but what I was eating. My metabolism does much better on a low carb diet. I know much more now about nutrition and what is and is not good food. I absolutely do NOT recommend weight loss surgery. "PEOLPE DRINKNIG TEH MLIK IS NOT NORMAL!!!!" "Drink teh milk at your own risk! Drink teh milk and you will be cast into the lake of fire..."
Whoops. Switched over into the wrong sermon, there. I understand that you are obsessed about milk and milk products, but there isn't the same sort of science supporting your assertions as there is supporting LCHF diets. I support the "fringe" theory of LCHF because there are peer reviewed studies to support it. When you bring the same number of peer-reviewed studies to support your theories about the dangers of milk, I'll pay attention. I happen to be suspicious about soy, but since there aren't a large number of studies demonstrating that it's dangerous, I pretty much STFU about it, and don’t shout at people and tell them they’re stupidly risking their lives by eating it. Yep, I admit it says, “possibly” to get the milk. "I think someone msut be spiking your milk...vodka comes to mind." Traci - that is a very sad story! I hope you're doing a little better now that you know what to eat? Speaking of quorn and egg whites being used, another product that is not vegan (that not many people know about) is WINE. Most wine (at least red, not sure about white) is clarified by using either animal fat or egg white, therefore vegans "should" choose vegan wines. I'm not vegan and I enjoy wine and quorn (doesnt taste much but is a nice substitute for meat if you add spices and sauce to it). My boyfriend doesnt like the british minced meat so whenever I want to cook tacos or bolognese he only eats it if I use minced quorn (he is NOT vegetarian). This still surprise me, just how lot of people have no idea about Diet Soluyion Plan﻿, despite the fact that many people get great results because of it. Thanks to my buddy who told me e about Diet Plan, I’ve lost lots of weight with it without starving myself. Could you explain the significance of Parkinsons and AIDS in the image above? Just for comparing the size of the circles, i.e. the number of people affected by the problem. Also, if I may, are you aware by any chance of the role of stealth infections/viruses in obesity? Many people are silently suffering from ME/CFS and similar hard to define ailments and increasing evidence is pointing to stealth viral infections. Kenny De Meirleir, a Belgian specialist, treats obesity in many of his CFS patients with free T3 since reverse T3 levels are high and renders them thyroid-resistant, not that dis-similar really to insulin-resistance, and thus fail to lose weight even on diets of 800 calories/day. The obesity story is in fact far more complicated than even Taubes would have us believe and in the future the role of infectious pathogens in obesity will gain far more attention than now. For the last week I've been starving myself at 800 calories a day. I am eating no meat, no dairy, and no processed foods apart from this brand of whole grain (100 calorie) English muffins that I like. It has a lot of fiber and is filling. Anyway.... I weigh 333lbs. I have a history of hashimoto's disease, hypertension, thyroid cancer, and PCOS. So many doctors have told me to get gastric bypass. So. Many. But, I can't see it as anything but more mutilation. The only time I've ever had surgery was to remove a very large ovarian cyst and the ovary it was attached to (after a torsion turned it necrotic), and I had a thyroidectomy with cervical lymph dissection (because of cancer). I will only ever have surgery under extreme circumstances. I want to continue with this low carb, no meat, no dairy diet and I need to know at some point that I'm going to see some effect. At my size "the weight should be flying off." That is what I am told. But... My TSH level was recently 50. My T4 (low) and my T3 was close to zero. Having a history of bad thyroid problems and now, having no thyroid at all, I am dependent on synthroid. Even with it, my metabolism is all screwed up..... I maintain my current weight at a 1000 kcal/day diet. And that is only if I am eating 1000 kcal/day of fruits and vegetables (not meat, not dairy). The moment I touch meat or dairy (even the lean kind) I gain weight. The only fats I consume come from extra virgin olive oil, fish oil supplement, black currant oil supplement, or avocado. I take a daily MTV along with metformin, vitex, aspirin, lisinopril, and aldactone. I am not diabetic, but have horrible acanthosis nigricans from insulin resistance. Gastric bypass cuts away your stomach/resections it so that you feel full. It causes a lot of people to eat <700kcals/day and go into ketoacidosis. Gastric bypass people don't have much energy while they are still overweight and on a starvation diet. They have headaches from too few carbs and the same risk of kidney stones (if not more) than people who are starving themselves to become thin. If I eat a starvation diet of fruits and veggies I am still going to be taking in more nutrients than gastric bypass pts. And I will be better able to tolerate water in the amounts needed to avoid stones. Right? I'm doing this and I'm committed. I would rather die than go off of this restriction and see myself gain more weight. But it is discouraging. I've been hovering 500-800kcal/day for the last week and only seen two pounds shed. And... don't they always say the first week you see the most results because of water weight? I mean. This is pretty discouraging. Still, it's the only thing I can do. For this first month, I'm not going to exercise, just calorie restrict. Next month I'm going to start light aerobic activity (walking). And I will progress as soon as I see weight come off. How about this: The risks of surgery are low compared with doing nothing at all. 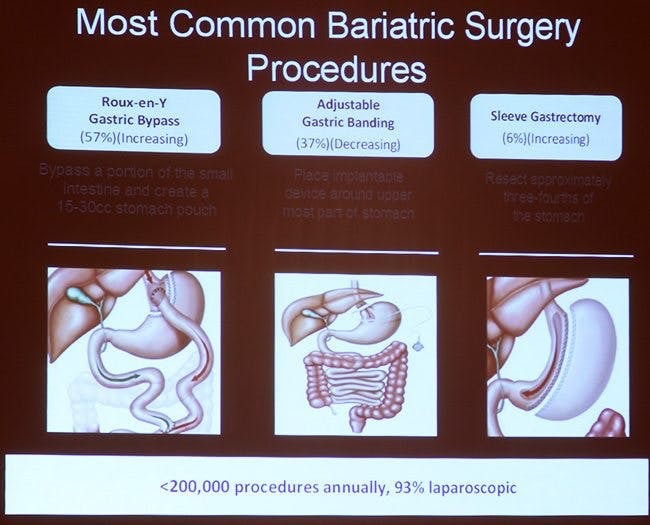 Though weight-loss surgery has a reputation for being risky, the procedures have improved over the years and are a lot safer now; the ASMBS reports that the chances of having a major complication are only about 4.3 percent. The risks of staying obese — heart disease, diabetes, stroke, and even death – are far more dangerous. 10. Most people say they'd do it again in a heartbeat. Though success is a long-term project for patients who undergo this serious procedure, most people say that if they could go back in time, they'd choose to have the surgery again. Many people report that after the surgery and subsequent weight loss they feel better, are more active, and take fewer medications to treat the complications of obesity — all of which can greatly improve a person's quality of life. Please quit it with the low carb belief. Why are carbs out to be the bad guy? Think about it. The staple food in Asian countries is white rice, and the majority of the people are slim. They even eat rice 3 times a day!!! We need to be eating the right carbs. Don't get it confused with cakes and pies and breads, I'm talking about beans, lentils, potatoes and rice. When we think of carbs we think of cakes and pies filled with animal fat and carbs combined. How long does it take...how many days..to stop the intense cravings once i've switched to LCHF? One of the reasons i crave is that my serotonin and dopamine levels are so low due to long term depression and anxiety. Also chronic low blood sugar that after a 5 hr glucose tolerance test, never does go back up to a "comfortable" range. I feel like a drug addict! Cravings for chocolate, bread, corn fruit, it's extreme....even if i am full from eating proteins and fats. I know, as any addict in recovery does, that I need to have a "one day at a time" mentality. I would so appreciate any tips and advise, especially in answereing my question: How many days until the cravings stop or lessen? HELP! How long does it take...how many days..to stop the intense cravings once i've switched to LCHF? One of the reasons i crave is that my serotonin and dopamine levels are so low due to long term depression and anxiety. Also chronic low blood sugar that after a 5 hr glucose tolerance test, never does go back up to a "comfortable" range. I feel like a drug addict! Cravings for chocolate, bread, corn fruit, it's extreme....even if i am full from eating proteins and fats. I know, as any addict in recovery does, that I need to have a "one day at a time" mentality. I would so appreciate any tips and advise, especially in answereing my question: How many days until the cravings stop or lessen? Email me I would love to join on your journey. Its simple: aside from people with legitimate diseases (NOT obesity), people who have these operations are simply lazy and of poor discipline. Imagine choosing to have your stomach removed (or most of it) because you really dont want to put in the effort to overhaul your diet and do a bit of exercise? Absolutley unbelievable. And then the hardworking thinner people pay for it. What a way to go, modern society! Obese people arent victims, they are liabilities, to their families, their society and to themselves. No sympathy for you. It's not about laziness or lack of discipline, it's about being given the wrong information and therefore the wrong advice. People severely obese desperately want to lose the weight and are trying their best to follow their doctor advice but, if the advice is wrong, it is not their fault if it's not working when they "overhaul" their diet and actively exercise. DietDoctor site is discouraging bariatric surgery, offering a solution that works, based on science: Low Carb High Fat. It does not cost anything to taxpayers!!!! If you have never been 100 pounds overweight and unable to lose it, then you should not judge people and offer "simple" solutions when you obviously don't know what you are talking about. Your comment makes you sound like a mean and insensitive "know it all". By the way obesity is a "legitimate" metabolic disease. Wow. I didn't have time to read all the replies but so many seem to be anti-weight-loss surgery. I always say I lost 100 pounds 100 times and have tried every diet known to man. I started starving myself in 4th grade which destroyed my metabolism. By the time you're 100 pounds overweight stats show you only have a 5% chance of keeping it off for five years. By the time I had surgery 17 years ago I was at the point where I told them to either fix me or let me die on the table because I did not want to live in my body another day. I lost 130 pounds and have kept it off. I am the healthiest I have ever been in my life and I volunteer full time online trying to help people understand that for so many it's about the demons in their heads. After I lost the weight I learned to not numb my pain with food. I have communicated with thousands of patients over the last 17 years and as someone else said above the complications are rare. Very very unfortunate but rare. I have also talked with many that had them and they said they aren't sorry they had the surgery. Again my heart breaks for those who had major problems. I have over 16,000 members on my public Facebook page for weight loss surgery. Everyone chooses their way to not die from obesity. We shouldn't fight about it. I won't criticize your way and you shouldn't criticize mine. Be kind. You don't always know everyone's story. Like many other people, I thought Gastric Bypass was the answer to my battle with Obesity. After 18 years, I live everyday with regret. I lost 145 lbs. going from 280 down to 135 at my lowest weight. This list continues to grow. families who are devastated. " Complications Rare I think Not!!! I have lost my teeth and had to have crowns placed on most of them. This is something that is becoming more of a thing long term. I hd no prior dental problems. I have to have Iron Iv therapy every 3 months 5 units at a time 1200 dollars a pop. Living in the United States, I have a high Deductible of 12,000 a year. I have met that deductible every year for the past 6 years. This surgery has a high price. And my insurance paid 100% of the surgery, but they will not pay for any of the complications. I know that some people may continue to support Gastric Bypass, But I will not. There are better ways of losing weight and LCHF is so far the Best I have found. AND I will say getting your head right is part of the battle. My good friend died because of gastric bypass surgery. Died. The end. Change your diet. Find a well respected nutritionist. Get the hell away from any doctor that thinks cutting into your body and messing with your organs is a smart option for something that can be fixed with diet changes. Yes, I get it, a change in eating habits can be hard, I respect that struggle, but you desearve to live and thrive, not die because some butcher says you need to loose weight through this barberic surgery.